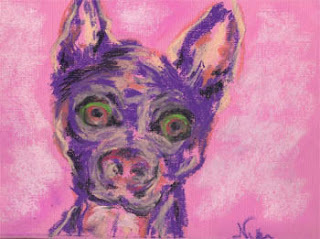 Haven't painted anything new in a couple weeks, so I thought I would start small to warm back up-- this is a quick portrait of my sister's very energetic little dog. It kind of sums up how I've been feeling these last couple weeks, with so many shows happening at once. I have work in three shows this month. What happens in Fallbrook...happens all at once! I am an artist from Southern California. If I don't have paint under my fingernails, I'm a grumpy girl.